Welcome to the San Remo vacation rentals. 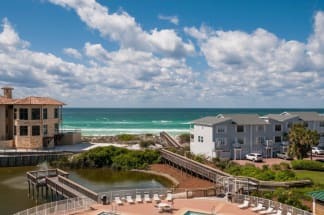 This breathtaking condo complex is located on Santa Rosa Beach in South Walton. If you are looking to truly enjoy the beauty of the emerald green waters of the Gulf, this is the complex to do it. These condos are located on the beach with views of the gulf that will leave you gazing for hours. The complex has several amenities such as the large community pool, exercise room, spacious hot tub, outdoor grilling area and private beach access. These luxurious condominiums come equipped with all of the amenities and appliances you could need while on vacation! After your long day on the beach head to one of the local favorite restaurants such as Great Southern Café, Fish Out of Water, or Bud and Alley’s. San Remo has everything for you to enjoy a perfect family vacation including many activities and opportunities for the whole family to have fun! Book your next trip to San Remo with ECBYO.com. Please contact one of our friendly property owners and they will gladly help you plan your get-a-way. Simply click on the 'Email Owner' button found on each listing to send the property owner a message directly. ECBYO does not charge any service fees when you book with us! We hope you enjoy your trip to San Remo.